This is the Xara Editor window which appears when you open a document or template. The user interface is the same for touch-based devices such as tablets and for desktop. 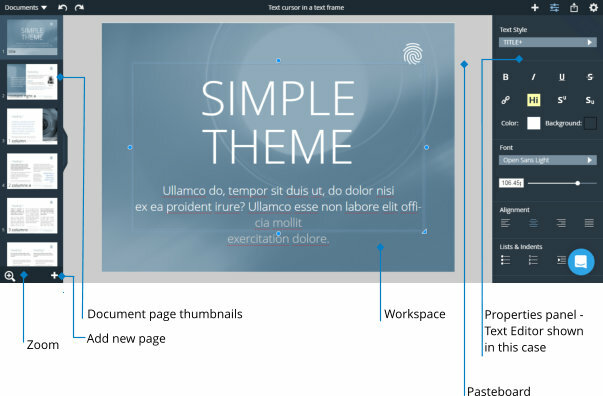 On the left side of the editor is the document panel, it contains a preview of all slides of your document, a '+' add new page menu and the Zoom. The text editing properties side panel shown on the right of the interface appears automatically on wide screens, but not for narrower screens such as tablets. In the latter case it’s necessary to click the properties control button on the top bar to show, or hide it again. The properties panel changes depending on the object selection. Selected text will have a different panel then an image. The controls are very simple with just a few buttons along the top bar. The center region of the top bar shows various status messages, and if there’s nothing selected on the page, the filename of the current file. Tip: Press Esc to clear any selection, or tap on the background. Tip: Hold the mouse pointer over the filename on the top bar to see the associated cloud drive and pathname of the file (Dropbox only).